MOBILE, Alabama — Revisit the drama of high school in the musical “Fame,” presented by Sunny Side Theater at the Murphy High School auditorium. The play tells the story of a diverse group of classmates at a New York City performing arts high school. They dance, sing and act their way through high school as the class of 1984. The cast has high school students representing six area schools. The 30-member, all-high-school cast includes Kate Teague as Carmen Diaz; Cassie Mahler as Serena Katz; Meagan Reynolds as Iris Kelly; Payton Reedy as Grace Lamb; Katie Kelly as Mabel Washington; Margie Powers as Goody King; Tim Aguirre as Nick Piazza; Gerald Archard as Tyrone Jackson; Colin Bodet as Joe Vegas; Alex Hall as Scholomo Metz; Sarah Pennington as Miss Sherman; Haley Horn as Miss Bell; Ann Claire Carnahan as Miss Myers and Katelyn Tucker as Miss Sheinkopf. Sunny Side Theater collaborated with Brandy Brown Studio to help produce the show. 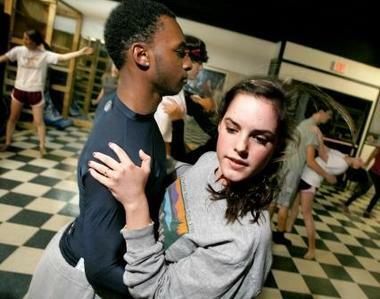 Teague, who’s been singing and dancing at the studio for many years and plans to major in music in college, said she enjoyed the friendships that formed while doing the show. Other performers are Mary Hartley King, Gabrielle Picard, Mariah Stewart and Julian Truxillo. Singers include Quoizel Franklin, Verniecisha Glover, Mary Beth Sheffield, Victoria Taylor and Peyton Thomasson. Dancers include Katherine Keeney, Elisabeth Nichols, Mary Alice Perez, Callie Robinson, Caroline Dickerson, Lydia Newton and Kendall Brown. The play’s choreographer is Brandy Brown Pendleton and assistant choreographer is Lyndsay Mathis. The play, conceived and developed by David DeSilva and Jose Fernandez, is rated PG-13 for mild adult language and content, said Paragone. The lyrics are by Jacque Levy and the music is by Steve Margoshes. The play is the first all-high school production for the theater, Caten said. The musical numbers include chorus-type songs, duets and solos with back-up singing, he said. The various songs give the play a nice '70s feel, Caten said. It allows the theater’s older actors to participate in a real show that is not just a children’s show. “There is non-stop dancing and singing,” added Caten. “It’s going to be extremely entertaining."